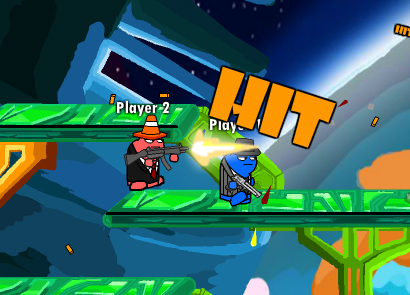 Gun Mayhem 4 is a fun shooting game where the player has to fight off other opponents with different kinds of weapons that are available. It can be played both as a single player game against AI opponents or as a multiple player game with many friends. You can customize the looks of each player by clicking on the player and editing. The game can be played in the campaign mode or in the custom mode. Players The number of players can be chosen as the first step of the game. Different characteristics of each player can be customized. Once a character is chosen, the characteristics can be edited by clicking on the edit player link below the character. Face, eyes, mouth, hands, shoe, hair, cap and few more attributes can be chosen. The attributes can be imported or shared over with friends. 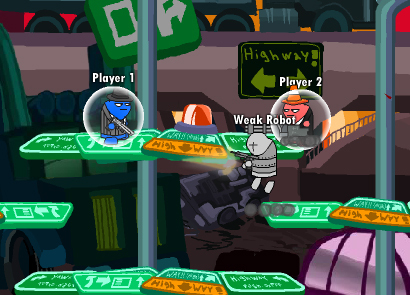 The player has to fight off different number of opponents in each case. 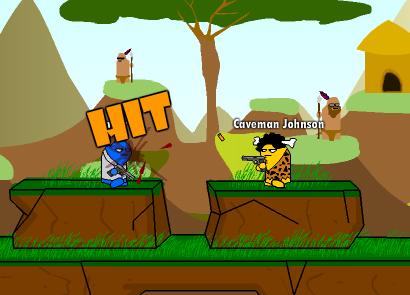 Each of the players will get 5 lives and the players can use the special attacks to fight with the opponents. The buttons Z and X are used for this purpose. Controls This game can be played using the keys on the keyboard as controls. - Down arrow button will help you to shield yourself in case of an attack. The buttons Z and X are used for attack 1 and attack 2. These special attacks are different on different games as the weapons also differ depending on the environment you choose. You can drop the weapon on to your opponents by clicking on the key ‘D’ on your keyboard. It is possible to pause the game using a spacebar. 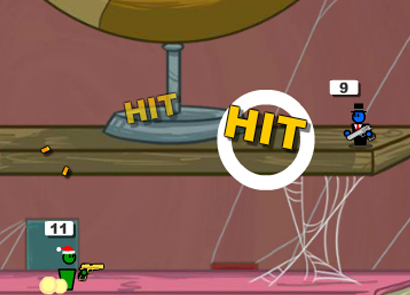 How To Play Gun Mayhem 4 is a challenging game, but don't worry - it is not too hard. The first few levels are quite simple actually. You will get a hold of everything really quickly. This game is as easy to play as Return Man. Not only kids can play it - but also adults since as I mentioned - there are many challenging levels that will take you some time to complete. Zones There are a total of three zones zone1, zone 2 and zone 3. Each of these zones have different game environments. Zone 1 – Town Tussle – you have to fight against local bullies Tribal trouble – you have to fight off the troubling monkeys and help the umbungo tribe Farmageddon – you have to take out a greater number of foxes than the farmer Grave situation – you have to fight against zombies in the graveyard. More games may be unlocked as you proceed. Zone 2 – Castle hassle, spaced out, shore booty, mansion melee are the environments you can choose freely at the start and more games can be unlocked later. 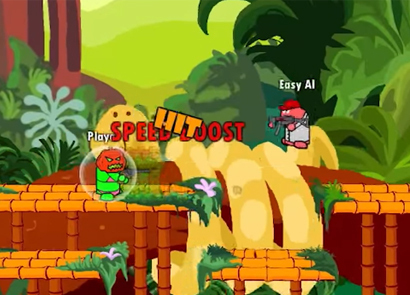 Castle hassle – you have to fight the enemies to help your battlement and defend the castle. 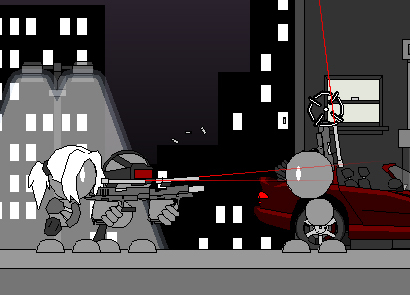 Spaced out – Fight for humanity against the invading aliens. 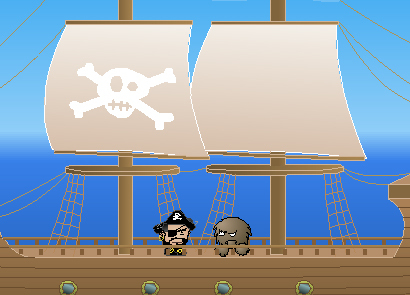 Shore booty – fight against pirates and get the treasure. Mansion melee – investigate and fight the opponents in this variety of haunted mansion. Zone 3 – lava palaver, scaffold scuffle, snow brawl, crate factory can be chosen when you play the game and more games will be available to you as you proceed. Lava palaver – fight against lava monsters. Scaffold scuffle – shoo away the kids who have broken again into a construction site. Snow brawl – defend yourself against the angry polar population Crate factory – fight against the maintenance droids and stop them from ruining the weapon crates. As you hover over the environment lists, you will get to see the details. 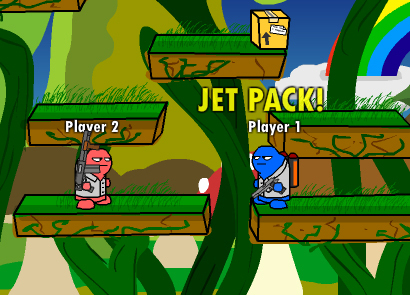 Each of the games uses different weapons with which you will fight the opponents.